This continues the introduction started here. You can find an index to the entire series here. In Part 6 we came face-to-face with this fact: callbacks are a fundamental aspect of asynchronous programming with Twisted. Rather than just a way of interfacing with the reactor, callbacks will be woven into the structure of any Twisted program we write. So using Twisted, or any reactor-based asynchronous system, means organizing our code in a particular way, as a series of “callback chains” invoked by a reactor loop. Even an API as simple as our get_poetry function required callbacks, two of them in fact: one for normal results and one for errors. Since, as Twisted programmers, we’re going to have to make so much use of them, we should spend a little bit of time thinking about the best ways to use callbacks, and what sort of pitfalls we might encounter. If we get the poem, print it out. If we don’t get the poem, print out an Error Haiku. In either case, end the program. So the callback is like the else block and the errback is like the except. That means invoking the errback is the asynchronous analogue to raising an exception and invoking the callback corresponds to the normal program flow. What are some of the differences between the two versions? For one thing, in the synchronous version the Python interpreter will ensure that, as long as get_poetry raises any kind of exception at all, for any reason, the except block will run. If we trust the interpreter to run Python code correctly we can trust that error block to run at the right time. Contrast that with the asynchronous version: the poem_failed errback is invoked by our code, the clientConnectionFailed method of the PoetryClientFactory. We, not Python, are in charge of making sure the error code runs if something goes wrong. So we have to make sure to handle every possible error case by invoking the errback with a Failure object. Otherwise, our program will become “stuck” waiting for a callback that never comes. That shows another difference between the synchronous and asynchronous versions. If we didn’t bother catching the exception in the synchronous version (by not using a try/except), the Python interpreter would “catch” it for us and crash to show us the error of our ways. But if we forget to “raise” our asynchronous exception (by calling the errback function in PoetryClientFactory), our program will just run forever, blissfully unaware that anything is amiss. Clearly, handling errors in an asynchronous program is important, and also somewhat tricky. You might say that handling errors in asynchronous code is actually more important than handling the normal case, as things can go wrong in far more ways than they can go right. Forgetting to handle the error case is a common mistake when programming with Twisted. Here’s another fact about the synchronous code above: either the else block runs exactly once, or the except block runs exactly once (assuming the synchronous version of get_poetry doesn’t enter an infinite loop). The Python interpreter won’t suddenly decide to run them both or, on a whim, run the else block twenty-seven times. And it would be basically impossible to program in Python if it did! But again, in the asynchronous case we are in charge of running the callback or the errback. Knowing us, we might make some mistakes. We could call both the callback and the errback, or invoke the callback twenty-seven times. That would be unfortunate for the users of get_poetry. Although the docstring doesn’t explicitly say so, it really goes without saying that, like the else and except blocks in a try/except statement, either the callback will run exactly once or the errback will run exactly once, for each specific call to get_poetry. Either we get the poem or we don’t. Imagine trying to debug a program that makes three poetry requests and gets seven callback invocations and two errback invocations. Where would you even start? You’d probably end up writing your callbacks and errbacks to detect when they got invoked a second time for the same get_poetry call and throw an exception right back. Take that, get_poetry. Can we refactor the asynchronous version in a similar way? It’s not really clear that we can, since the callback and errback are two different functions. Do we have to go back to a single callback to make this possible? Calling errbacks is very important. Since errbacks take the place of except blocks, users need to be able to count on them. They aren’t an optional feature of our APIs. Not invoking callbacks at the wrong time is just as important as calling them at the right time. For a typical use case, the callback and errback are mutually exclusive and invoked exactly once. Refactoring common code might be harder when using callbacks. We’ll have more to say about callbacks in future Parts, but for now this is enough to see why Twisted might have an abstraction devoted to managing them. Since callbacks are used so much in asynchronous programming, and since using them correctly can, as we have discovered, be a bit tricky, the Twisted developers created an abstraction called a Deferred to make programming with callbacks easier. The Deferred class is defined in twisted.internet.defer. The word “deferred” is either a verb or an adjective in everyday English, so it might sound a little strange used as a noun. Just know that, from now on, when I use the phrase “the deferred” or “a deferred”, I’m referring to an instance of the Deferred class. We’ll talk about why it is called Deferred in a future Part. It might help to mentally add the word “result” to each phrase, as in “the deferred result”. As we will eventually see, that’s really what it is. Let’s try this out. Since deferreds don’t use the reactor, we can test them out without starting up the loop. You might have noticed a method on Deferred called setTimeout that does use the reactor. It is deprecated and will cease to exist in a future release. Pretend it’s not there and don’t use it. Just like the callback/errback pairs we used in client 3.1, the callbacks we add to this deferred each take one argument, either a normal result or an error result. It turns out that deferreds support callbacks and errbacks with multiple arguments, but they always have at least one, and the first argument is always either a normal result or an error result. We add callbacks and errbacks to the deferred in pairs. 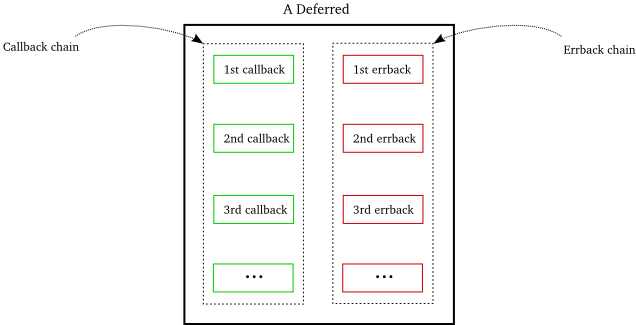 The callback method fires the deferred with a normal result, the method’s only argument. Looking at the order of the print output, we can see that firing the deferred invokes the callbacks immediately. There’s nothing asynchronous going on at all. There can’t be, since no reactor is running. It really boils down to an ordinary Python function call. So firing the errback chain is just a matter of calling the errback method instead of the callback method, and the method argument is the error result. And just as with callbacks, the errbacks are invoked immediately upon firing. [Failure instance: Traceback (failure with no frames): : I have failed. This means when we use deferreds we can go back to working with ordinary Exceptions and the Failures will get created for us automatically. A deferred will guarantee that each errback is invoked with an actual Failure instance. Notice those final print statements are never called. The callback and errback methods are raising genuine Exceptions to let us know we’ve already fired that deferred. Deferreds help us avoid one of the pitfalls we identified with callback programming. When we use a deferred to manage our callbacks, we simply can’t make the mistake of calling both the callback and the errback, or invoking the callback twenty-seven times. We can try, but the deferred will raise an exception right back at us, instead of passing our mistake onto the callbacks themselves. This is basically our original example above, with a little extra code to get the reactor going. Notice we are using callWhenRunning to fire the deferred after the reactor starts up. We’re taking advantage of the fact that callWhenRunning accepts additional positional- and keyword-arguments to pass to the callback when it is run. Many Twisted APIs that register callbacks follow this same convention, including the APIs to add callbacks to deferreds. The addBoth method adds the same function to both the callback and errback chains. And we can refactor asynchronous code after all. Note: there is a subtlety in the way this deferred would actually execute its errback chain. We’ll discuss it in a future Part, but keep in mind there is more to learn about deferreds. We can’t ignore errbacks, they are required for any asynchronous API. Deferreds have support for errbacks built in. Invoking callbacks multiple times will likely result in subtle, hard-to-debug problems. Deferreds can only be fired once, making them similar to the familiar semantics of try/except statements. Programming with plain callbacks can make refactoring tricky. With deferreds, we can refactor by adding links to the chain and moving code from one link to another. We’re not done with the story of deferreds, there are more details of their rationale and behavior to explore. But we’ve got enough to start using them in our poetry client, so we’ll do that in Part 8. The last example ignores the argument to poem_done. Print it out instead. Make got_poem return a value and see how that changes the argument to poem_done. Modify the last two deferred examples to fire the errback chains. Make sure to fire the errback with an Exception. Read the docstrings for the addCallback and addErrback methods on Deferred. Of course, you are right. I’m not sure what I was thinking there, though perhaps I meant to indicate, with the different argument names, that the callback and errback arguments receive different kinds of values. But I think your version is better, I’ll make that change with the next update, thank you. That’s a nice tip on the __future__ import, though I think I’ll leave it 2.x style. Yeah, I agree, the second one is definitely best. print, print is just too confusing for people reading 2.x code. Which, as the name suggests, adds the cb to both the cb and eb chains. Hi, exercise 1 is very interesting. I assumed it was because the callbacks/errbacks were chained and looked at twisted.internet.defer.addCallbacks() to verify. I also tried chaining more by combining addBoth(), addCallback(), addErrback(), and addCallbacks(). Very nice introduction to Deferreds. Thank you. Thank you very much for the work and passion you put in this book! You write in the style i usually learn things – i need to know WHY is it like this, not just HOW to do things. >That shows another difference between the synchronous and asynchronous versions. If we didn’t bother catching the exception in the synchronous version (by not using a try/except), the Python interpreter would “catch” it for us and crash to show us the error of our ways. But if we don’t bother calling the errback function in PoetryClientFactory, our program will just run forever, blissfully unaware that anything is amiss. Thanks Victor, glad you like the series. I’ll try making an little adjustment to that paragraph and you can tell me if it’s clearer. What do you think of the new version? I’m trying to emphasize that in synchronous code the Python interpreter will guarantee that an except: block will run when it’s supposed to, while in the asynchronous code we’ve been using it’s mostly up to us to make sure that happens. But you decide – this just my opinion. Ah, I was actually trying to explain the case where no asynchronous exception happens at all — because we forgot to call the errback. Hi Dave. I didn’t quite get this. But clientConnectionFailed is twisted code right and twisted will call it when something goes wrong. We only define what is inside this function. So how are we responsible for making sure the error code runs? Hello! So I am contrasting try/except, which is built into the Python runtime system, with the asynchronous errback mechanism, which is provided by Twisted (which is just another Python program). Twisted has to add asynchronous error handling on top of Python itself. So in this case by ‘we’ I mean Twisted and your code together. Does that make sense? Hi Dave. Another question. How does deferred know which is a callback and which is an errback? What if my errback was called got_poem? It’s the order of the arguments to addCallbacks that matters. The first argument is the callback, the second argument is the errback. They could be called anything, it wouldn’t matter. Hi Dave. I modified defer-2.py as below. Im expecting to see only callback to work and invoking errback should throw an error. Why does “Your poem is served” appear twice. Doesnt it mean callback fn “got_poem” was invoked twice? Even though callback and errback were added to the deferred. You are calling got_poem directly and then the deferred calls it again. hi Dave. Im not clear how deferred will call the errback. We don’t pass it while invoking callLater. reactor.callWhenRunning(d.callback, ‘Another short poem.’). I tried executing defer-9 example. I have the server running but I get the following error. Serving poetry/ecstasy.txt on port 10001.
twisted.internet.error.ReactorNotRunning: Can’t stop reactor that isn’t running. poem_done() is being called without fetching the poem. In defer-9.py the errback will never be called since the code fires the callback chain and no exceptions are raised by the callbacks. In the code for addErrback() in twisted\internet\defer.py, reproduced here, where does ‘passthru’ come from? On the face of it, it looks like an undefined global, but clearly I am missing something here. Convenience method for adding just an errback. Also, how should one enter a codeblock when replying. I have just failed to do this, and I can see a lot of other people have also failed to enter codeblocks. Code usually just appears as badly formatted text and loses indentation. Hi Dave, I am a little bit confused about the use of defferred and reactor. Is it true that we only need to declare the object Defferred() and add callback and errback, after which we just run the reactor() and it will figure out if there is defferred() to be fired and invoke it? or we should explicitly fired the defferrd() manually? Hi Zirong, that depends on the context. A lot of Twisted APIs will return a deferred and those will fire automatically. If you specifically create a new Deferred then either you will need to arrange for it to be fired or pass it to an API that will do so. I’d recommend you keep reading, hopefully this will become clear.